Slithermon is the PUP that uses misleading techniques to prevent removal. Use Reimage to locate malicious components and get rid of them faster than with uninstall instructions. A full system scan blocks virus reappearance and prevents traffic to malicious domains. Why these ads appeared in my browser? How to get rid of Slithermon ads? The reason why Slithermon ads started showing up in your browser is that your computer has been infected with an adware program. The official website allows Internet users to play a well-known game called Slither.io; however, these ads have nothing in common with it. Adware is compatible with Google Chrome, Microsoft Edge, Mozilla Firefox, and Internet Explorer. After Slithermon hijack users start seeing an excessive amount of ads wherever website they visit. This PUP employs a “virtual layer” which allows placing third-party advertisements on every Internet site. Therefore, users might notice an increased amount of ads on their favorite websites. Ads by Slithermon might be delivered in the form of pop-up, banner, in-text, coupon and other types of online ads. We have to warn you to stay away from these eye-catching advertisements. They might be tricky, misleading and even dangerous. After one click on the “great offer,” you might install Trojan, ransomware or other malware. For this reason, you should not hesitate and scan your computer with a reputable anti-malware program, such as Reimage or Malwarebytes MalwarebytesCombo Cleaner and remove Slithermon ads from the system. This potentially unwanted program generates so many ads that your computer performance will slow down considerably. Besides, your browser might crash and freeze once in a while. But it’s not the worst part. So-called Slithermon virus might track information about users. Adware is interested in your IP address, most visited websites, time spent on particular pages, search queries, clicked advertisement and similar information related to your browsing habits. Keep in mind that this information might include personally identifiable details about you, and, what is worse, information about you might be shared with shady third-party businesses. Gathered and analyzed information is necessary for generating and providing personalized advertisements. The creators of adware are interested in generating revenue from pay-per-click advertising strategies. There’s no secret that chances that Internet users click on ads are higher when they are interesting for them. However, you should not trust any potentially unwanted program. They might deliver hazardous ads and even try to steal your personal information. Therefore, do not hesitate and initiate Slithermon removal ASAP. Adware which is responsible for Slithermon ads might have got inside the computer when you download and installed the latest program. The developers of potentially unwanted programs use deceptive software marketing technique – bundling. This method is widely used because computer users do not pay proper attention to software installation. Hackers take this bad habit as an advantage and spread their bogus applications. Adware might be added as an optional program to the regular software package and hidden under “Standard” or “Basic” installation mode. When installing programs, keep in mind that installation wizards do not openly disclose about additional downloads. You have to find them and reject their installation yourself. For doing this, you have to choose “Advanced” or “Custom” setup and when you see the checkbox with suggested programs, deselect them all and continue the installation. Intrusive online advertisements are bothering, annoying and decrease browsing experience a lot. Therefore, you should not reconcile with this unpleasant issues. 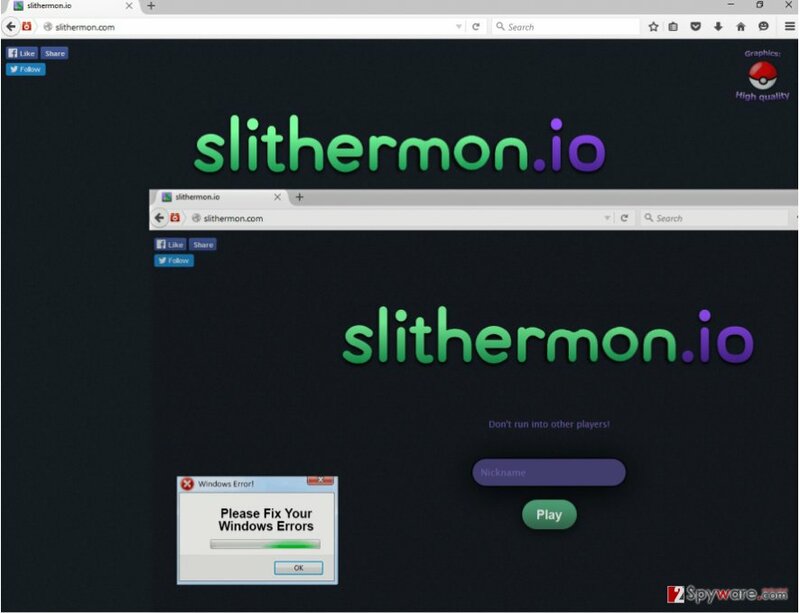 Remove Slithermon ads with the help of a professional anti-malware program. However, some computer users are not willing to employ additional software and want to eliminate adware manually. Keep in mind that this method is more complicated, requires more time and effort because you have to detect and eliminate adware with all its components without additional help. In order to help you, we prepared manual Slithermon removal guide below. To remove Slithermon ads from the computer, you have to detect and eliminate adware with all its components. Follow the instructions carefully and don’t forget to check your browsers. This PUP might have been installed additional applications to your PC and web browsers. Here, look for Slithermon or any other recently installed suspicious programs. It rarely happens that adware program gets inside Mac; however, if you see intrusive ads by Slithermon, follow the instructions and get rid of the adware. Later, check your web browsers and remove all suspicious components. Wait until you see Applications folder and look for Slithermon or any other suspicious programs on it. Now right click on every of such entries and select Move to Trash. This PUP might have installed additional applications to Internet Explorer. Follow the instructions below and remove all questionable add-ons from the browser. When in the new window, check Delete personal settings and select Reset again to complete Slithermon removal. Adware might have been installed additional extensions or plugins to your browser. Follow the instructions and remove all of them. Once these steps are finished, Slithermon should be removed from your Microsoft Edge browser. To remove Slithermon ads completely, you have to look through the list of extensions and uninstall all questionable add-ons that might have been installed to your Mozilla Firefox. Here, select Slithermon and other questionable plugins. Click Remove to delete these entries. Now you will see Reset Firefox to its default state message with Reset Firefox button. Click this button for several times and complete Slithermon removal. After adware elimination, check the list of extensions and look for questionable entries. This adware might have been installed suspicious plugins that should be removed immediately. Here, select Slithermon and other malicious plugins and select trash icon to delete these entries. Click Reset to confirm this action and complete Slithermon removal. Follow the instructions below and uninstall all questionable extensions that might have been installed to your Safari. Here, select Extensions and look for Slithermon or other suspicious entries. Click on the Uninstall button to get rid each of them. Now you will see a detailed dialog window filled with reset options. All of those options are usually checked, but you can specify which of them you want to reset. Click the Reset button to complete Slithermon removal process. This entry was posted on 2016-11-06 at 23:25 and is filed under Adware, Viruses. You can quickly scan the QR code with your mobile device and have Slithermon ads manual removal instructions right in your pocket. How did you remove Slithermon ads?